Each fall, Arizona education officials report their enrollment numbers. We combine, compare and analyze the figures for North Phoenix schools. Below is the latest data, for the 2017-18 school year. See our DVUSD Schools 2017-2018 Special Report for enrollment projections. 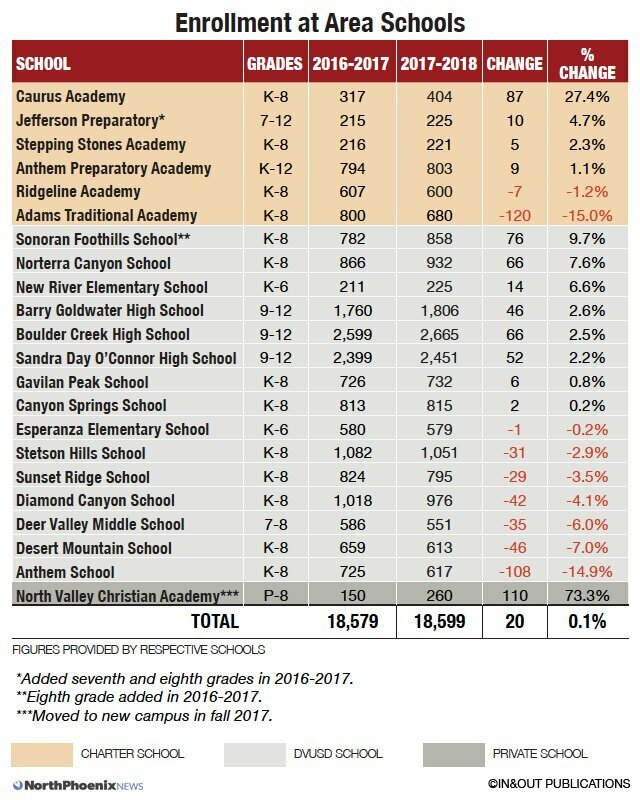 OCT. 3, 2017 — Overall student enrollment figures in North Phoenix-area charter schools are almost exactly the same this fall as last year, but for the first time in a number of years, Deer Valley Unified School District area enrollment did not decline significantly. Enrollment at four of the six area charter schools increased for the 2017-2018 school year. Caurus Academy continued its trend upward for the third consecutive year with an increase of 27.4 percent. Caurus expanded at the start of the 2017-18 school year, adding an additional section in grades 6–8 in its new building along 41st Drive in Anthem. 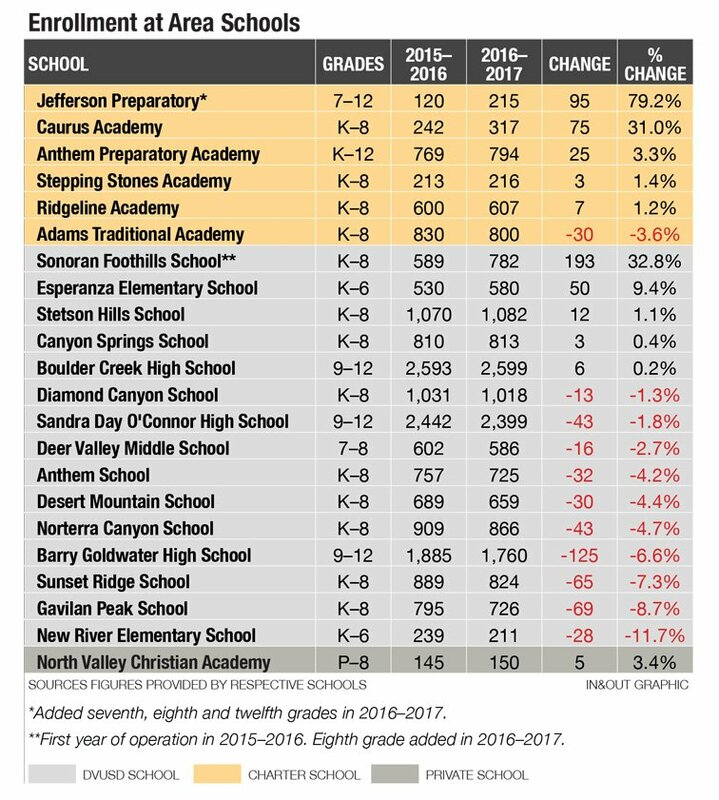 Adams Traditional Academy, consistently the highest performing AzMERIT school in the area, saw a 15 percent drop in student population. The student body increased at eight of 15 DVUSD schools in the area, with Sonoran Foothills and Norterra Canyon seeing the highest gains, due to residential buildout between Happy Valley Road and Carefree Highway. The most notable decline was at Anthem School, where a nearly 15 percent loss occurred, as expected. Overall, DVUSD enrollment shifts were in line with projections the district made in its annual enrollment analysis. 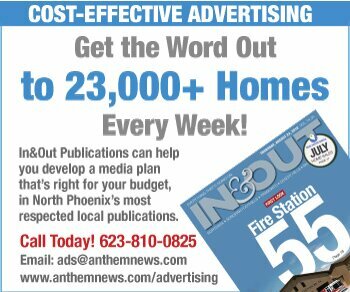 [See “Student Body Shrinks in Aging Anthem Area,” In&Out, July 27, 2017.] Geographically, fewer students enrolled in the Anthem-area schools, while gains were seen in the schools south of Carefree Highway. Enrollment in five of the six North Phoenix charter schools increased for the 2016-2017 school year, while the student body count fell at 10 of 15 DVUSD schools in the area. Overall, enrollment at these district schools declined by 200 students, while charters added 175. The addition of eighth grade at Sonoran Foothills School increased matriculation by 33 percent, with the majority of new students coming from nearby Sunset Ridge School, whose student body shrank due to the new boundaries. Some schools with enrollment decreases such as Gavilan Peak School, happened to have a larger graduating class last year―28 more eighth graders, according to DVUSD spokesperson Monica Allread. “These enrollment bubbles happen sometimes when a larger class graduates or is promoted to high school,” she told In&Out. And, others such as New River Elementary, which lost 11 percent of its enrollment (after losing more than 12 percent the previous year), are being monitored. “We are closely watching enrollment at all of our schools, and will work with a demographer who helps us predict enrollment in the future,” Allread said. With the addition of grades 7 and 8, Jefferson Preparatory (which underwent a name change) saw its population surge 79 percent. Its first class of 12th grade is set to graduate spring 2017.